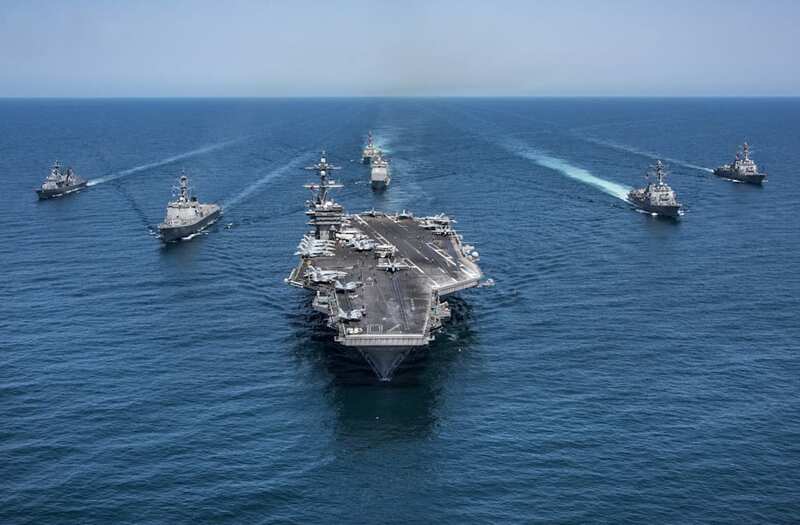 Peak tensions between the US, North Korea, and its neighbors have brought on a weighty response from the US and South Korean navies. Despite initial confusion about when the USS Carl Vinson aircraft carrier would show up off the coast of the Korean peninsula, the carrier strike group has finally arrived in all its glory. South Korean naval destroyers Sejong the Great and Yang Manchun, the U.S. Navy Arleigh Burke-class guided-missile destroyers USS Wayne E. Meyer, USS Michael Murphy and USS Stethem, the Ticonderoga-class guided-missile cruiser USS Lake Champlain and the Nimitz-class aircraft carrier USS Carl Vinson transit the western Pacific Ocean May 3, 2017. An F/A-18E Super Hornet launches from the U.S. Navy Nimitz-class aircraft carrier USS Carl Vinson during flight operations in the western Pacific Ocean May 2, 2017. Picture taken May 2, 2017. F/A-18 Hornets and Super Hornets fly over South Korean destroyers Sejong the Great and Yang Manchun and the U.S. Navy Nimitz-class aircraft carrier USS Carl Vinsonas they transit the western Pacific Ocean May 3, 2017. Sailors conduct flight operations aboard the U.S. Navy Nimitz-class aircraft carrier USS Carl Vinson in the western Pacific Ocean May 2, 2017. Picture taken May 2, 2017. Joined by the Republic of Korea's very capable Sejong the Great and Yang Manchun destroyers, the USS Wayne E. Meyer, USS Michael Murphy, USS Stetham destroyers, and the Ticonderoga-class guided-missile cruiser USS Lake Champlain flank the Vinson as F-18 Super Hornets fly overhead in a massive show of force. Together, the South Korean and US ships represent some of the most potent missile defenses ever put to sea.